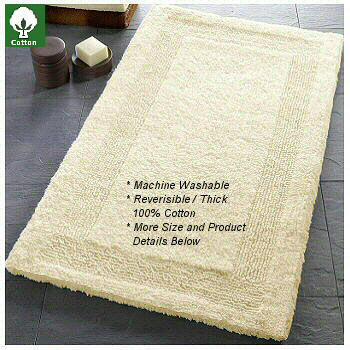 Beautiful high quality 100% cotton rug with a dense soft pile 16mm / .63in pile height. Snow White Beautiful snowy white reversible cotton bath rug. Silver Grey Very light silver grey. This grey rug has a very soft color to the design. Natural Light creamy beige. Very subtle and elegant. Arizona elongated lid covers are a solid color and coordinate with each rug swatch. The Arizona lid covers are 100% cotton.